If you’ve fallen prey to the Marie Kondo effect and are in a current state of trying to declutter your entire life, you might want to start with your bedroom. While it’s supposed to be a space of zen and relaxation, it can frequently turn into a storage unit of sorts—closets overflowing with clothes you swear you’ll wear someday, nightstands whose surfaces are littered with a bevy of items that couldn’t find a home anywhere else. Well, suffer no more. 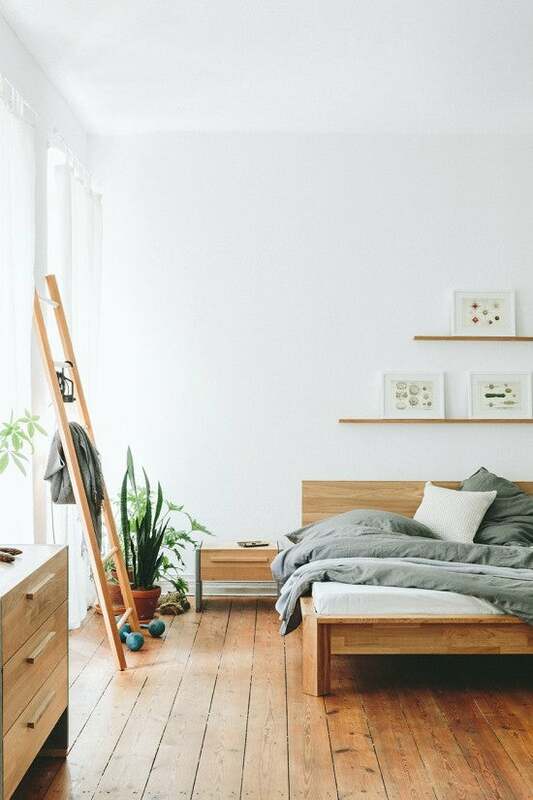 If these bedrooms can make minimalism work, there’s hope for us all. Adhering to a minimalist aesthetic has its stylistic benefits, but it can actually help you sleep better too. From a color standpoint, peaceful palettes of subdued tones instantly calm, making you more likely to catch z’s faster. From a practicality standpoint, it’s significantly easier to clean a minimalist bedroom. Less clutter = less cleaning = less stress. Feeling inspired? Here are our favorite pared-back bedrooms that just might inspire you to follow suit and declutter. Tip to steal: Keep as much as you can off the floor. In this -1 even a lamp on the nightstand would take up valuable space. Plug-in sconces and fun pendants are a great alternative to floor lamps, drawing the eye up and keeping your floors clean in the process. Tip to steal: Stick to uniform shades of wood. If you like the natural look, try to match. This makes everything look more cohesive, which in turn instantly makes any room look tidier—exhibit A, here. Plus, it’s significantly easier to shop for a space (and conversely, eliminate extra things you don’t really need) when you have strict parameters for what materials are allowed in a room. Tip to steal: Bring in texture. Minimal doesn’t have to mean sterile—quite the opposite, in fact. Make up for what you lack in excess decor or even color by layering in textures. Rugs, woven baskets, and an assortment of linens all create a cozy, calming space without overpowering. Tip to steal: Keep your nightstands clean. It might seem impractical to some used to keeping a tray of accessories within arms reach of the pillow, but that’s why nightstands with drawers were invented. Or if your nightstand doesn’t have drawers, like this room here, seek extra storage elsewhere: in baskets tucked in the corner, or even under-bed bins. When your bedroom surfaces are kept minimal, they open up the whole room. A smaller bed means more open space, creating a lighter, airier feel in any bedroom. Particularly if you’re working with a tiny bedroom, downsizing can be a good thing—it forces you to evaluate what you have and toss whatever (quite literally) doesn’t fit. Make your twin feel elevated by relying on textures to zhoosh it up. Where you might be hesitant to do so in your kitchen, for fear of your dinner plates collecting dust, decor items you won’t be eating off of are a little more forgiving. Here, the shelves bring visual interest by way of artwork in addition to being potentially helpful organization tools. Tip to steal: When in doubt, go neutral. Tonal neutrals feel instantly sophisticated, reminiscent of a luxe boutique hotel. For those who take “minimalist” to mean “minimal color,” embrace the achromatic aesthetic. An assortment of off-white hues in natural materials like linen keeps even the most faded of spaces from feeling one-note. Steer clear of stark whites if you don’t want your bedroom feeling too bland. Tip to steal: Make your furniture count. This may be too little, too late for people not starting from scratch with a bedroom, but wherever possible, choose your furniture and decor additions carefully. If financially feasible, investing in antiques or timeless pieces you’ll have for years to come minimizes your consumer footprint and eliminates the need to keep buying more things—making you a minimalist in the most literal sense of the word. Kate Zimmerman’s space has perfected this tactic.